You may well be aware of the ruling, made in October 2016 by a UK employment tribunal and being appealed against, that Uber drivers are, in fact, employees of Uber and are therefore entitled to certain rights such as a minimum wage, sick pay and annual leave. Whether or not this is good for the country, for Uber, or for the drivers themselves has divided opinion in the national press but what I'm interested in is the implications it may have for other self-employed businesses delivered in the digital economy – such as proofreading and editing. Can a similar ruling be expected for proofreaders who work for an agency? Will freelance proofreaders be expecting sick pay and holiday pay from agencies? Is it comparable? Uber is marketed by Uber through their app. The drivers do no marketing whatsoever. Proofreading agencies market directly to their customers through their website. The proofreaders do no marketing whatsoever, apart from some selected 'editor profiles'. Customers engage the service via the app. The service is then provided by the driver. Uber controls a feedback/scoring system to ensure quality of service. Customers engage the service through the agency website. The proofreaders then provide the service. The agency (in some cases) has quality assurance editors who look over/polish the edited text to ensure quality of service. Uber's app dictates the rate according to location, car type, service requirements, supply and demand and the standard miles and minutes used. Customers agree to the Uber rates. Drivers have no say in what they get paid per job. The editing agency dictates fixed rates for the customer based on the length of the work and sometimes the difficulty or level of editing required (decided by broad bands such as heavy editing or proofreading). Customers agree to the agency's rates. Proofreaders can, in some cases, agree their own rate with the agency on a per 1,000-word basis but if you charge high, then you may not get any jobs. Uber offers a 24/7 service. The drivers can choose when they are available for work. Drivers can also work for other companies, such as Lyft. The proofreading/editing agency may work business hours, or 24/7. Proofreaders can say when they are available to work, either through the agency's website/system, or by rejecting projects/offers of work. Proofreaders can also work for other agencies, or directly for customers in a traditional freelance capacity. Can you reject a job? Uber pretty much accepts all customers that can load money into their app. Drivers who are available have to cancel quickly before being assigned to the job, or get the customer to reject them. The drivers must accept 80% of rides or be disqualified by Uber as a result. There are reports of Uber drivers being disqualified for not being sufficiently active (available for work) in a given month. The proofreading/editing agency will tend to accept all work from all customers. Proofreaders have the option of rejecting a specific assignment, provided that they can give a reason for doing so. How the agency deals with unavailability varies by agency, but in my experience being unavailable is OK. There are obvious advantages to working for an agency; the main one that jumps to mind is that an agency might be better-equipped to market themselves successfully and attract customers. Marketing a freelance business is possibly the most important thing that any freelancer has to do, and getting it right requires technical and interpersonal skills, a lot of effort, is potentially costly and can take a very long time to bring results. Kateproof's blog post on marketing a freelance proofreading business. Louise Harnby has written several articles on marketing for editors and proofreaders. Louise Harnby's book, Marketing Your Editing & Proofreading Business. Agencies, like Uber, offer a service to both customers and service providers by ensuring the quality of service and doing the necessary marketing to help the customer to find an appropriate service provider. Both services have all of their monetary and information exchanges focused through the website/app with no direct exchange of money between service provider and customer. There is more scope for a freelance proofreader to turn down a specific job for the editing agency than for an Uber driver to select which rides they will offer/to whom. Turning work down is the sort of thing a freelancer does; if the person paying you dictates your workload, then it sounds more like employment. 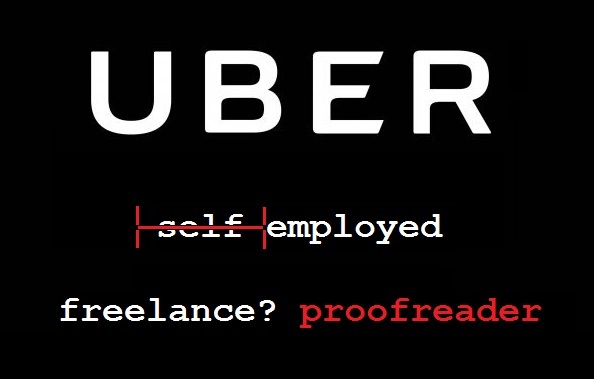 The freelance proofreader can negotiate their own rate with the agency, whereas Uber sets the prices. This means that a freelance proofreader is in control of whether or not they earn minimum wage, as long as the agency will offer them work at their specified rate. If no-one would work for less than the minimum wage, then wages could not drop below that level. Uber states that they provide a 'technology platform' and deny that they employ drivers. Agencies also provide a platform to enable the service to be delivered, but in the case of the editing agency, there is usually a further stage of quality control and admin perfomed in-house so the end-product is only partially outsourced to the freelancer. HMRC are keen to stop companies dodging their employer's NI contributions through permanently employing freelancers. To help employers avoid breaking the law, they made a tool to see if you are officially self-employed or not. My personal approach is to treat agencies in much the same way as I do any other freelance client: if I am offered a job at a rate that works for me then I will take it on; if I am not, then I won't. I set my rate per 1,000 words high enough so that I earn enough from each proofreading job to cover my costs and risks but the Uber driver has no control over this and in some cases, such as the two cases that led to the ruling in the employment tribunal, they had been earning below the minimum wage. It's always a tricky topic to raise with other proofreaders, but I aim for an hourly wage in line with the Society for Editors and Proofreaders' (SfEP) suggested minimum rates of pay, which is a rate that includes an uplift to account for the costs and uncertainties of running a freelance business. What are your thoughts? I'd love to hear your views, so I started a discussion on facebook.